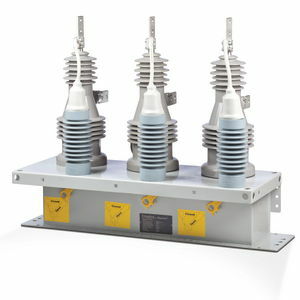 CSD Oil-Filled 125kV BIL, 200A Switch, 17"
CSD Oil-Filled 150kV BIL, 90A Switch, 17"
CSD Oil-Filled 150kV BIL, 90A Switch, 24"
CSD Oil-Filled 95kV BIL, 200A Switch, 11"
SmartClose 15kV, 110kV BIL, 200A Synchronous Vacuum Switch, 18"
15kV, 110kV BIL, 200A 3ph tank capacitor switch with 3-120V solenoid operators for optional independent pole operation, 3 manual open/close handles, 6 integral voltage sensors, substation frame compatible mounting flange, 5-pin receptacle for control cable, and fiber optic compartment with 2 AVAGO snap-on bulkhead connectors. Includes wildlife covers. SmartClose 15kV, 110kV BIL, 200A Synchronous Vacuum Switch, 33"
15kV, 110kV BIL, 200A 3ph tank capacitor switch with 3-120V solenoid operators for optional independent pole operation, 3 manual open/close handles, 6 integral voltage sensors, substation frame compatible mounting flange, 5-pin receptacle for control cable, and fiber optic compartment with 2 AVAGO snap-on bulkhead connectors. Includes wildlife covers. For use in pole bank applications. SmartClose 15kV, 110kV BIL, 400A Synchronous Vacuum Switch, 18"
15kV, 110kV BIL, 400A 3ph tank capacitor switch with 3-120V solenoid operators for optional independent pole operation, 3 manual open/close handles, 6 integral voltage sensors, substation frame compatible mounting flange, 5-pin receptacle for control cable, and fiber optic compartment with 2 AVAGO snap-on bulkhead connectors. Includes wildlife covers. 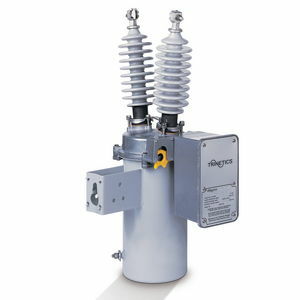 SmartClose 27kV, 125kV BIL, 200A Synchronous Vacuum Switch, 18"
27kV, 125kV BIL, 200A 3ph tank capacitor switch with 3-120V solenoid operators for optional independent pole operation, 3 manual open/close handles, 6 integral voltage sensors, substation frame compatible mounting flange, 5-pin receptacle for control cable, and fiber optic compartment with 2 AVAGO snap-on bulkhead connectors. Includes wildlife covers. 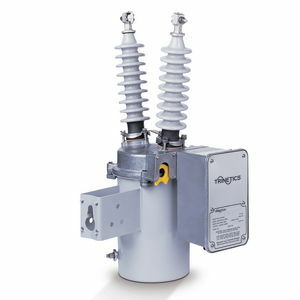 SmartClose 27kV, 125kV BIL, 200A Synchronous Vacuum Switch, 33"
27kV, 125kV BIL, 200A 3ph tank capacitor switch with 3-120V solenoid operators for optional independent pole operation, 3 manual open/close handles, 6 integral voltage sensors, substation frame compatible mounting flange, 5-pin receptacle for control cable, and fiber optic compartment with 2 AVAGO snap-on bulkhead connectors. Includes wildlife covers. For use in pole bank applications. 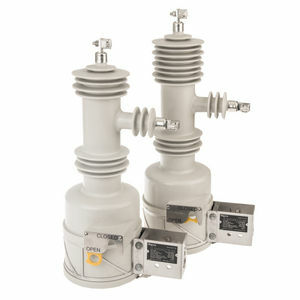 SmartClose 27kV, 125kV BIL, 400A Synchronous Vacuum Switch, 18"
27kV, 125kV BIL, 400A 3ph tank capacitor switch with 3-120V solenoid operators for optional independent pole operation, 3 manual open/close handles, 6 integral voltage sensors, substation frame compatible mounting flange, 5-pin receptacle for control cable, and fiber optic compartment with 2 AVAGO snap-on bulkhead connectors. Includes wildlife covers. 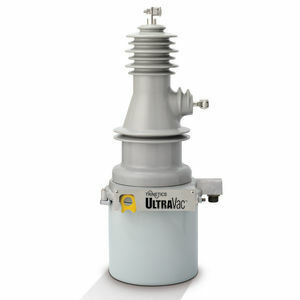 UltraVac 15kV, 110kV BIL, 200A Solid Dielectric Vacuum Switch, 27"
UltraVac 15kV, 110kV BIL, 200A Solid Dielectric Vacuum Switch Compact, 11.5"
UltraVac 15kV, 110kV BIL, 200A Solid Dielectric Vacuum Switch Compact, 18"
UltraVac 15kV, 110kV BIL, 200A Solid Dielectric Vacuum Switch, 33"
UltraVac 15kV, 110kV BIL, 400A Solid Dielectric Vacuum Switch Compact, 18"
UltraVac 15kV, 125kV BIL, 200A Solid Dielectric Vacuum Switch Compact, 11.5"
UltraVac 15kV, 125kV BIL, 200A Solid Dielectric Vacuum Switch, 27"
UltraVac 20kV, 125kV BIL, 200A Solid Dielectric Vacuum Switch Compact, 18"
UltraVac 20kV, 125kV BIL, 200A Solid Dielectric Vacuum Switch, 33"
UltraVac 20kV, 150kV BIL, 200A Solid Dielectric Vacuum Switch Compact, 18"
UltraVac 20kV, 150kV BIL, 200A Solid Dielectric Vacuum Switch, 33"
UltraVac 22kV, 150kV BIL, 400A Solid Dielectric Vacuum Switch Compact, 18"
UltraVac 24kV, 125kV BIL, 200A Solid Dielectric Vacuum Switch Compact, 18"
UltraVac 24kV, 125kV BIL, 200A Solid Dielectric Vacuum Switch, 33"
UltraVac 24kV, 150kV BIL, 200A Solid Dielectric Vacuum Switch Compact, 18"
UltraVac 24kV, 150kV BIL, 200A Solid Dielectric Vacuum Switch, 33"
VS Series 15kV, 125kV BIL, Vacuum Under Oil Switch, 17"
VS Series 15kV, 95kV BIL, Vacuum Under Oil Switch, 11"
VS Series 24kV, 125kV BIL, Vacuum Under Oil Switch, 17"